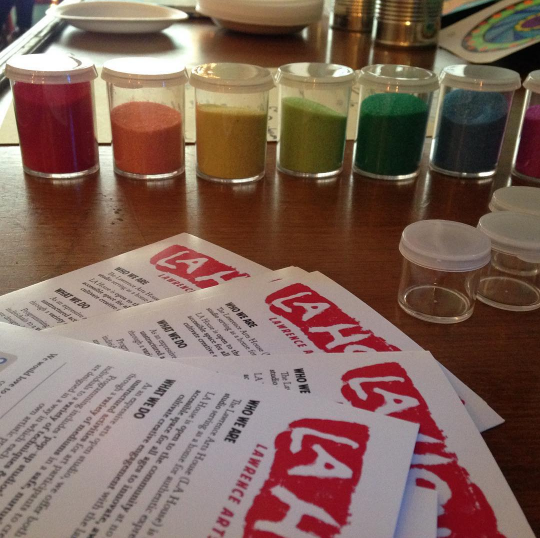 The Lawrence Arts House (LA House) is an expressive arts open studio which serves as a home for authentic expression and creative change. Fostering creative community connections, LA House seeks to empower individuals as active agents for change, ultimately supporting the larger growth and development of individuals, families and their communities. LA House is open to the community at no charge, promoting an accessible space for all ages to innovate, awaken curiosity, and cultivate creative engagement with the larger community. As an expressive arts open studio, the space offers both structured and unstructured activities for art participants to create and explore through a variety of mediums in a safe, nurturing environment. Programming includes ‘pop-up studios’ in schools and local organizations, making arts accessible in a variety of spaces. We also offer structured expressive arts classes exploring drawing, creative movement, crafts, and innovation. By offering a variety of artistic modalities (visual arts, storytelling, movement, music, drama, literature, to name a few) the studio nurtures and supports unique artistic processes to anyone willing to explore the arts. These sessions introduce individuals to a variety of techniques and modes of expression, and are structured in a way in which each participant can engage in their own artistic project and process. If you would like to visit, participate, contribute, and create, please email Fernanda, Issa & Renée at lawrenceartshouse@gmail.com. BUILDING BACK BETTER. Read more about THP's progress in rebuilding after the 2015 Nepalese earthquakes devastated the region. THP raises critical support towards the preservation of the cultural traditions of the indigenous people of the Himalayas through education, community development and social outreach. VMT works with individuals in their entirety, recognizing that, as the body is host to the voice, it is necessary to re-embody that voice, not just from the diaphragm up, but through a holistic engagement of body, mind and soul.